Condition : 100％ NEW and High Quality Suit for DDR DDR2 DDR3 DDR4. 1 Heat Sink. 2 Heat Conduction Silica Gel （inside）. If you have any problem, we will make every effort to solve it. Fan Size: 40×40×10mm. Material: Plastic Aluminum Alloy. Air Flow: 10-28CFM. Suit for DDR DDR2 DDR3 DDR4. If you have any problem, we will make every effort to solve it. 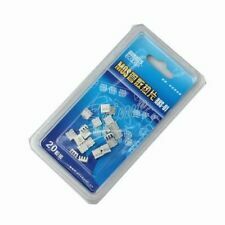 The heatsink with 3M tape ,It is easy to use,convenient. Material:Aluminum&Heat Conductive Tape. self adhesive. Bottom Size:14mmx13mm. You need to check the size if you want to paste on other product. The heatsink with 3M tape,it is easy use on your MOS. USe: For MOS IC cooling. 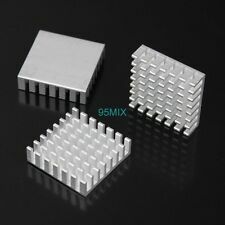 Mini 6.5x6x3.5mm Aluminum Heatsink. The heatsinks are very good at cooling your machine since it is made of Pure Aluminum and well designed. Easy cable routing. Daisy chain all of EZDIY DDR RGB heat sink with standard RGB 4-1pin (5V, Di, -, G). Compatible with ASUS Aura Sync, GIGABYTE RGB Fusion and MSI Mystic Light Sync. - With 4-1 (5V, Di, -, G). Trending at $28.14eBay determines this price through a machine learned model of the product's sale prices within the last 90 days. Improve RAM performance and avoid system crash by dissipating access RAM heat. Material: Aluminum Alloy. Effective size fits all motherboard. Quantity: 1 Set. Size: 13×2.7cm/5.12×1.06in (Approx.). Mini 40x37x45mm Aluminum Heatsink. 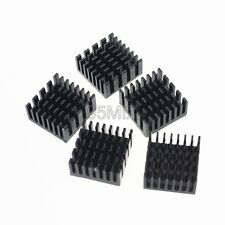 The heatsinks are very good at cooling your machine since it is made of Aluminum and well designed. enhance your trading reputation. It's just take you 1 minute. Fan Speed : 5000RPM. 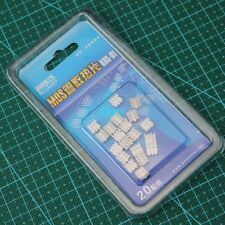 Fan Size : 40X40X10 mm. New Nvidia southbridge heatsink/fan for nforce 680i LT SLI motherboards. Its intended for Nvidia reference design 680i LT SLI motherboards such as the ones made by eVGA, XFX, BFG, Albatron, etc. Distance between push-pin occupied mounting holes edge to edge is 51mm (see picture 5). How to use: First daub a little thermal silicone grease (FYI: Do not use the low-end silicone grease), then put the right size copper shims, then daub a little thermal silicone grease again, last install the heatsink and tighten the screws. 20mm x 20mm x 0.8mm Thermal Pad Copper Shim for Cooling. 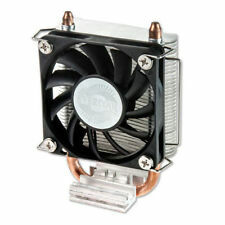 For Overheating GPU or CPU heatsink. Avoids system crashes by keeping RAM from overheating. High conductivity thermal pad. 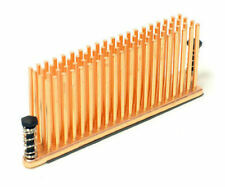 1 Heat Sink. 2 Heat Conduction Silica Gel （inside）. Improve RAM performance and avoid system crash by dissipating access RAM heat. Material: Aluminum Alloy. Quantity: 1 Set. Size: 13×2.7cm/5.12×1.06in (Approx.). Color: Blue / Silver / Black (Optional). Dissipates RAM heat improving its performance. High conductivity thermal adhesive tape. Material:Aluminum&Heat Conductive Tape. Bottom Size:14mmx13mm. Suit for DDR DDR2 DDR3 DDR4. Set of (8) PushpinsNEW. 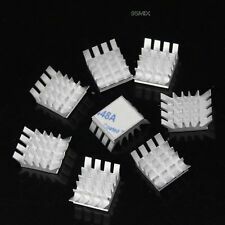 Use this set of (8) push-pins to mount heatsinks such as southbridge, northbridge and vga. Color: Black. Also note that monitor settings may vary from computer to computer and may distort actual colors. Due to the difference between different monitors, the picture may not reflect the actual color of the item. 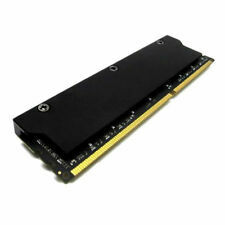 Compatible with all standards DDR DDR2 DDR3 SDRAM. Dissipates RAM heat, improve its performance. With thermally conductive adhesive tape. Material: aluminum alloy. Color: blue. Due to the difference between different monitors, the picture may not reflect the actual color of the item. The MOS-C1 heatsink is far superior to traditional heat sinks currently found on the market and it provides the best thermal conductivity available to dissipate heat from the MOSFET in your system. Pure forged copper. Dual-fan G.Skill Turbulence II Memory Cooling Fan for cooling of all types of memory modules and memory kits in desktop systems. 3500rpm, 1 ball bearing, dimemsions 50x50x11mm. Backed by 1 years warranty. Compatible with all standards DDR DDR2 DDR3 SDRAM. Dissipates RAM heat, improve its performance. With thermally conductive adhesive tape. Material: aluminum alloy. Also note that monitor settings may vary from computer to computer and may distort actual colors. 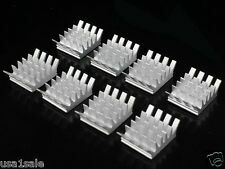 Lot of (2) 23mm x 23mm x 10mm Passive HEATSINK Stick-On NEW. Instructions: Peel off the protective layer on the bottom and press it on to a clean surface. THERMAL ADHESIVE LAYER PRE-APPLIED. Black Anodized Aluminum Alloy. 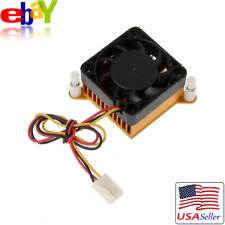 40x40x10mm 12V 3-pin cooling fan for computer motherboard north bridge. Fan Size: 40×40×10mm. Fan Speed: 5500 RPM±10%. Material: Plastic Aluminum Alloy. Quantity: 1 PC (other accessories demo in the picture is not included). 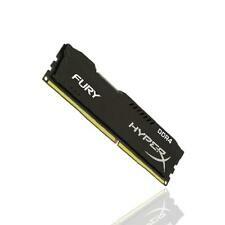 Suit for DDR DDR2 DDR3 DDR4. 1 Cooling Sink. 2 Heat Conduction Silica Gel(inside). Compatible with all standards DDR DDR2 DDR3 SDRAM. Dissipates RAM heat, improve its performance. With thermally conductive adhesive tape. Color: gold. Just peel off the backing paper of tape, you can use the item. ADD TO FAVS. Unpaid item Disputation will be opened then. Real Item pictures, what you see will be what you get! This is very important! Optimized natural convection. Pre-applied adhesive thermal tape. Applicable to single and double sided modules. Also note that monitor settings may vary from computer to computer and may distort actual colors. The fans use more advanced ball bearings, rather than standard sleeve bearings, for durability at higher temperatures and quiet operation. · Colour: As the picture shows. Made of Aluminum. · Materal: Aluminum. Square angle. Increase the reliability of your system by cooling down the memory. Improve RAM performance and avoid system crash by dissipating access RAM heat. Compatible with all standard SDR/DDR SDRAM. Effective size fits all motherboard. Easy installation with spring clips. Come with conductivity thermal adhesive tape. Brand Unbranded MPN Does not apply UPC 4894462141557. Trending at $2.14eBay determines this price through a machine learned model of the product's sale prices within the last 90 days. Heat sink with 10°C- 25°C cooling effect. Height: 5mm. This is very important! Just peel off the backing paper of tape, you can use the item. Unpaid item Disputation will be opened then. Net weight: 0.6g/pcs. NEW ARRIVAL. Optimized natural convection. Pre-applied adhesive thermal tape. Applicable to single and double sided modules. Color: Red. Also note that monitor settings may vary from computer to computer and may distort actual colors. Great for high performance or over clocked systems. Rate (item arrived). Other Countries. Improve RAM performance and avoid system crash by dissipating access RAM heat. Material: Aluminum Alloy. Color: Black. Due to the difference between different monitors, the picture may not reflect the actual color of the item. Evercool Video Card Heatsink and Fan Cooling System. Heatsink Material: Aluminum. Max Air flow: 4.93 CFM. Fan Speed: 5,000 RPM. Color: Black. Fan Noise Level: <21 dBA. Static Pressure: 2.61 mmH2O.